KTMtwins.com KTM Motorcycle and Product News: Rally Fairing for the KTM 690 Enduro! 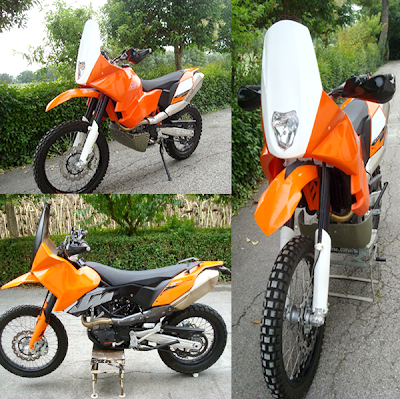 We are constantly on the look out for the most sought after parts for our customers and when we found out about this Dakar Rally Fairing for the KTM 690 Enduro we just had to let you guys know about it. We are currently trying to get an agreement worked out with the manufacturer so that we can offer up this really cool fairing and to our customers. We don't have too many details as of yet but will hopefully soon. With a version to accommodate the stock fuel tank and a version for the Safari Tanks you get to pick your poison. Keep an eye out for it on KTMTwins.com! Hi! Any news yet? Looks like a working concept together with the optional gastank. So, what is the status about the product today?